Distinctive styling and elegant lines come together to form a complete range of modern classics in the Sheffield Bathroom Vanity collection. Inspired by well established American standards and crafted without compromise, these vanities are designed to complement any decor, from traditional to minimalist modern. Available in multiple sizes and finishes. The contemporary and elegant design of this Bosconi Double Vanity features a bottom towel rack and four soft closing drawers. This is the perfect choice to meet your needs for additional surface space and storage, while remaining sleek and stylish. The grey finish is complimeted by silver tone hardware. The fully-assembled Hawthorne Collection creates a wealth of possibilities for Traditional style baths of any shape and size. Each one blends old-world charm with modern conveniences for a look that's both functional and warm in appearance. Hawthorne's raised panel doors, stylish drawer fronts and antique brass knobs add a touch of class to any bath. Also available in store by special order only see store for details. Classic yet elegantly modern, the Natalie bathroom vanity is a bold statement and a meaningful centrepiece for any bathroom. Inspired by the contemporary American design ethic and crafted without compromise, these vanities are designed to complement any decor, from traditional to minimalist modern. 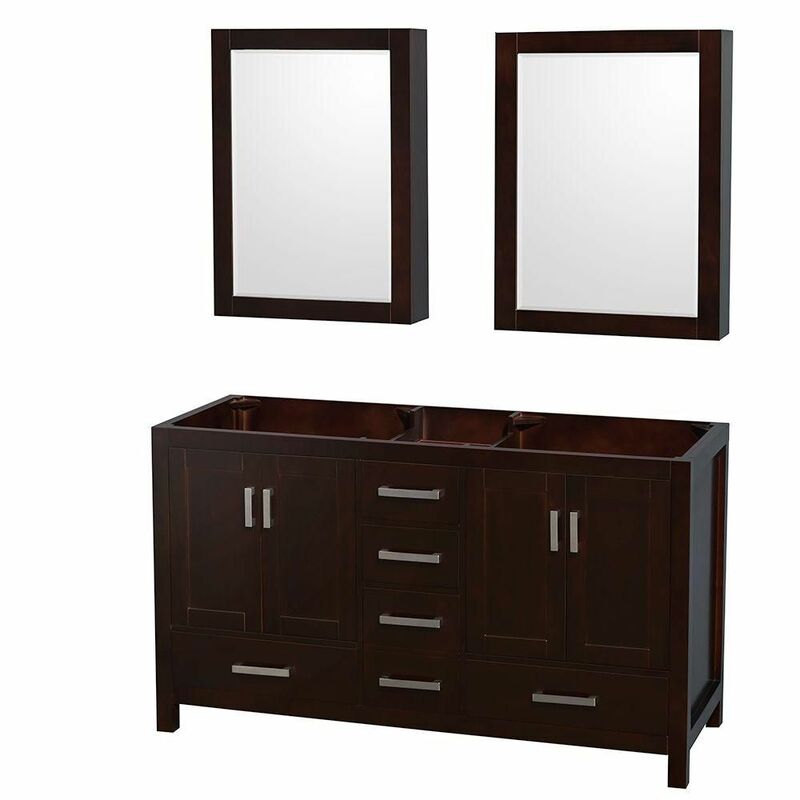 Sheffield 59-Inch Double Vanity Cabinet with Medicine Cabinets in Espresso Distinctive styling and elegant lines come together to form a complete range of modern classics in the Sheffield Bathroom Vanity collection. Inspired by well established American standards and crafted without compromise, these vanities are designed to complement any decor, from traditional to minimalist modern. Available in multiple sizes and finishes.